We report experimental evidence of non-resonant phonon-assisted tunneling at room temperature in GaAs/AlGaAs asymmetric coupled double quantum well (ACDQW) using power-dependent time-resolved photoluminescence (TRPL) spectroscopy. Molecular beam epitaxy was used to grow both ACDQW and the reference sample, an uncoupled quantum well. A biexponential decay of the TRPL spectra of the ACDQW sample was observed characterized by an initial fast decay followed by a slow decay. The initial fast decay was attributed to the tunneling of electrons from the narrow well to the wide well. This was further substantiated by an increase in the decay time of the TRPL spectra of the wide well of the ACDQW with increasing pump power. D. A. Lumantas, N. I. Cabello, J. D. Vasquez, E. Estacio, A. Salvador, and A. Somintac. 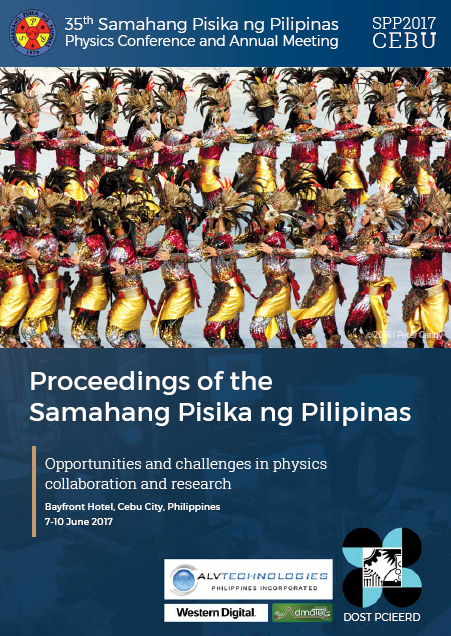 Power-dependent time-resolved photoluminescence spectroscopy of GaAs/AlGaAs asymmetric coupled and uncoupled double quantum wells, Proceedings of the Samahang Pisika ng Pilipinas 35, SPP-2017-1E-04 (2017). URL: https://paperview.spp-online.org/proceedings/article/view/239.